During the 1950’s Wegner experimented in combining timber with steel and developed three steel framed stacking chairs based around the Cow horn Chair. In 2014 Carl Hansen & Son launched one of the chairs under the name CH388. The three original versions pictured here were the first shown in some model apartments in connection with the construction of Denmark’s first modernist high-rise building – Bellahøjhusene. The complex, an open and park-like site plan with so-called tower blocks inspired by the work of Le Corbusier was result of an architectural competition in 1944 won by the architects Tage Nielsen and Mogens Irming. Several housing associate joined forces to build Bellahøjhusene with each appointing their own architect to design the detail of the individual apartements. chairs at the great Nordic Design Exhibition, H55 held in Helsingborg, Sweden. Thanks to the exceptional location on the harbour pier stretching out into the Öresund and the light and airy design of the exhibitions architecture the chairs were viewed by over a million visitors. However, none of the three chairs although designed for Fritz Hansen were never produced by the company. The original chairs were finished with a small elegant wooded foot plugged into the end of the steel frames – a detail typical of Wegner making the most mundane detail visually interesting. 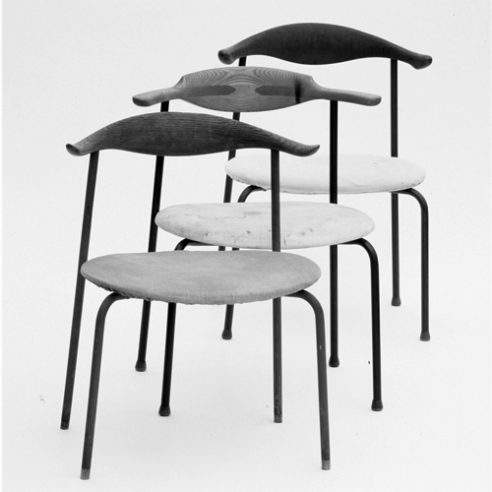 Wegner returned to the theme ten years later considerably refining the back support for chairs designed for use in his own home. The resulting Minimal Chair (pp701) were originally produced by Johannes Hansen and remained in the family home up to the designers death in 2007.